DP-6388B (DIY 600w, 1.0L) portable diy airless sprayer provides good spraying performance in a compact, portable design – making it perfect for small size residential painting jobs, from stains, enamel to latex. Easy to spray and easy to clean. Simply connect it to hose and gun in minutes. Ideal for family user, DIY painter, or any kind of small painting job. 1. 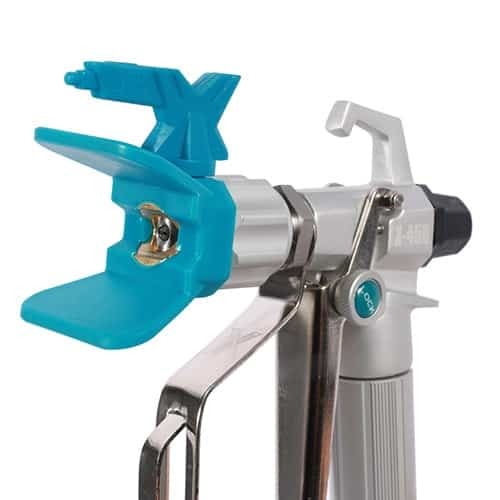 Kit include airless spray gun with 515# tip & safety base, 7.5m (25ft) 1/4″ hose, and manual. 2. Ideal for DIY users, remodelers or property maintenance painters with several painting projects a year. This will be the right sprayer for family users who want to repaint his house every 3 or 5 years. 3. Recommend to be connected with a paint roller for the refinishing your interior house if you don’t want to move the chairs, tables, furniture ,… Just cover them with the tape or newspaper, and then start your rolling jobs quickly! Enjoy your painting, and enjoy your life ! Convenient and Lightweight (9kgs), with built-in carrying handle, easy to take, and easy to store. Easy Pressure Control with user-friendly symbols for simple selection of operating modes from low pressure cleaning, medium pressure rolling, and high pressure airless painting . 600w single-phase universal motor with high speed, and draw in paint faster. Powerful Piston Pump offers modular components, easy maintenance and less problem. Built-in Gun Filtering System reduces tip clogging and improves finish. The piston rod, O-rings, gasket etc. Worn parts could be replaced which will save your maintenance cost. 3. Airless tip / tip gasket / tip guard / filter. 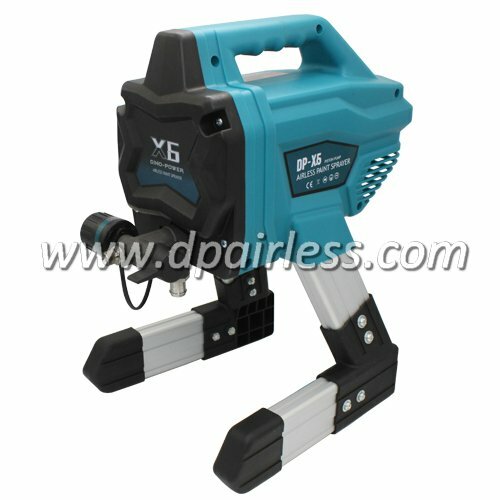 Airless pump, airless spray gun with 515 tip, 1/4*7.5m hose, suction tube, lubricating oil, manual. I want to be your distributor in USA for your airless sprayers. do you guys have ETL or UL approval already? how many years warranty do you offer? I’m looking for a good airless paint sprayer. Is it OK to buy one item. What will be the price with shipping to Norway. hi. do you sell the parts for this sprayer? what is the price range of this sprayer. Please can you send me a price on this pump and its DIY kit? We bought a paint spryaer early on. We’ve used it to paint the exterior of several houses. We also used it on a couple interiors too. On one interior, we went a room at a time and masked off the windows and covered the floor. Shooting the whole room only took a matter of minutes, but the prep work was way more extensive. In the beginning, I also used a TON of painter’s tape. Now I just use a good paint brush to cut in all my lines and basically don’t use tape at all. I still love the spryaer for outside, but I don’t get excited to use it inside. I generally do interiors by hand with a 9 roller, 4 roller, and 2-2.5 brush. I’ll prime where necessary and then paint over that when it’s dry. Our workers paint inside by hand too. I never have them paint the whole exterior of a house. I do that myself. They’ll do some touch up here and there, but I do whole houses with the spryaer. i want to buy this product for my renovation. How much is the price for this DP-6388B sprayer? The sprayer saved us days of time and effort over traditional brushes and rollers. I would very highly recommend this sprayer. Use was very easy with very little practice needed. Cleanup was quite easy as well. Be sure to remove and clean the small grit filter in the handle after each use – we initially missed this step and the filter plugged after the second day of usage. But once the filter (quite inexpensive) was replaced, and cleaned as directed, we had no problems at all. If you are looking for a good, inexpensive, reliable sprayer with great coverage, then look no further.